Perennials are plants that live for more than three years, returning each spring as the weather warms up to once again brighten the landscape. With more than 150 species, roses have been in existence for more than 35 million years. 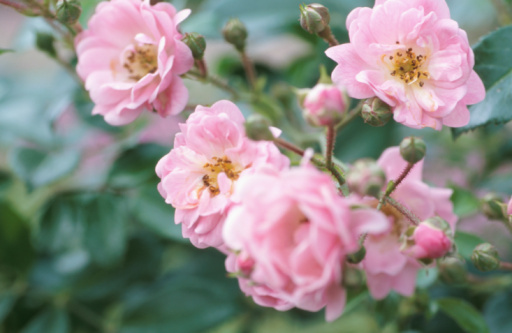 While roses in the home garden may not last quite that long, proper site selection, planting, care and pruning will ensure that perennial roses do continue to bloom every year. Roses are perennials that need the right care to bloom from year to year. When purchasing roses for the garden, select varieties that are hardy to the U.S. Department of Agriculture hardiness zone for the area. Roses need full sun, well-drained soil and good air circulation. Morning sun is beneficial as it helps to dry the leaves and prevent possible disease, and some afternoon shade will prolong the quality of the blooms. Roses will adapt to most soil types but prefer a fertile spot. When planting, enhance the area with organic material like compost or manure to increase the soil quality. 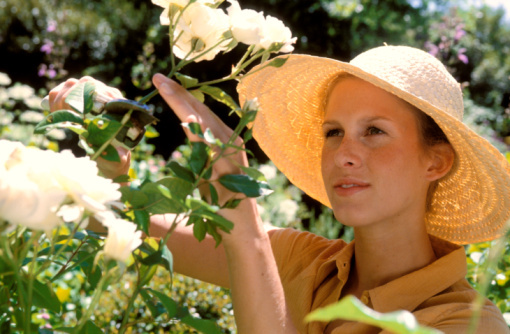 The ideal soil pH for roses is 6.0 to 7.0; ensure the bed is properly prepared before planting. Dig the hole deep and wide enough to accommodate plant roots, keeping the bud union level with the soil. Place the plant in the hole, fill two-thirds with soil, and add water, creating a muddy mix that gets through the roots. After the water has drained, add more soil and repeat the mud process until reaching the original soil level. Roses need 1 inch of water per week and sandy soil, and dry spells will require an increased watering frequency. Soaker hoses are ideal for roses because they deliver consistent moisture while keeping the leaves dry. Use a 10-10-10 fertilizer early in the season and again in mid-June, surrounding the plant 6 inches out. For roses that bloom repeatedly, apply another light fertilization in the middle of July, but do not apply any more after mid-August as it may promote growth that will not survive the winter. Keeping roses consistently cold and frozen rather than experiencing freezing and thawing numerous times is key to winter survival. As winter approaches, mound roses with 12 inches of a soil/compost mix, pruning any tall plants to prevent stem damage. Once the mound freezes, cover with evergreen cuttings or straw to help insulate the plant. A rose that goes into winter healthy has a good chance of coming out of the winter healthy so good summer care is essential. Pruning requirements vary depending on the type of rose, but all roses share the same pruning basics. Use clean, sharp pruners and cut at a 45-degree angle. Remove all dead wood or any canes that are thin, not growing well or weak, and deadhead any spent flowers at an outward-facing bud above a group of five or seven leaflets.